The digital revolution is not only here, it is accelerating every day. Advances in automation, the digitisation of information, unprecedented access to data and the democratisation of knowledge are transforming every sector of our economy – from healthcare to transportation to energy and beyond. The scope, scale, and ubiquity of these disruptions is truly unprecedented. 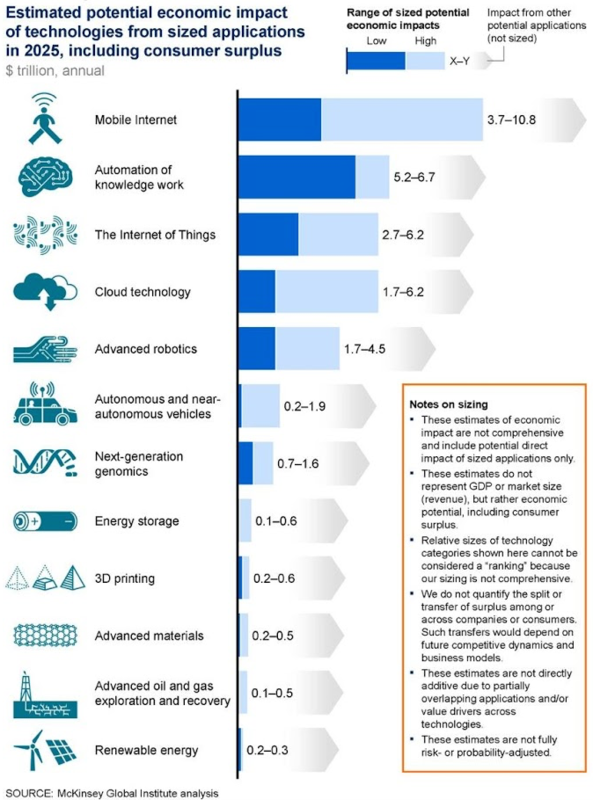 According to data from a recent McKinsey study, a dozen technologies, including genomics, energy storage, and automation, will drive major economic and societal transformation in the next several years. With a potential economic impact between $14 trillion and $33 trillion a year in 2025, the value of these emerging technologies could constitute one third of global GDP. As we embrace this tech-driven economy, universities must change, too, at a pace unfamiliar to higher education. While we retain our core mission of educating the next generation and cultivating new forms of knowledge, universities must also embrace our ever-expanding role in driving innovation and catalysing economic development. Our institutions must meet the challenges of the digital revolution head on, and play an increasingly important role in our innovation ecosystems and economies in four key ways. As the pace of discovery accelerates and global competition intensifies, universities are embracing entrepreneurship as part of the academic experience, creating cultures where innovative thinking is inspired and nurtured. As of 2017, more than 200 colleges and universities have launched centres dedicated for innovation or entrepreneurship as members of the Global Consortium of Entrepreneurship Centres. It seems that no matter what field they study, students come to college seeking to make a difference in society through startups, social entrepreneurship, and other ventures of their own creation. We see the same kind of energy and excitement in young faculty, too, who now expect to develop new technologies or engage in startups as part of their academic career. At a time when societal challenges are demanding discoveries at the intersections of diverse disciplines, fostering a culture of entrepreneurship is one of the most powerful ways that universities act as economic accelerators. 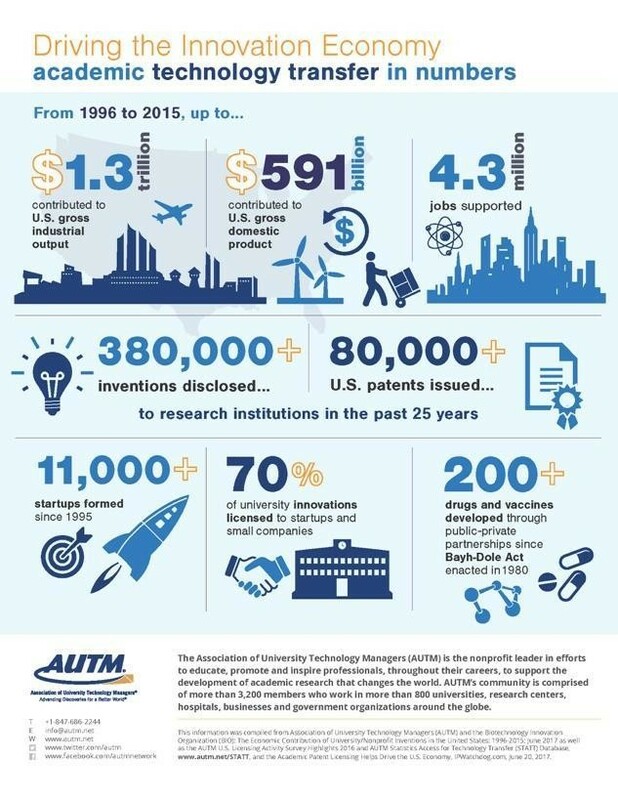 In fact, US-based data from the Association of University Technology Managers (AUTM) shows technology transfer from universities is playing an even more prominent role in economic development. The number of invention disclosures – a direct measure of institutional impact on innovation – has been on the rise the past five years, growing to 25,825 in 2016. At Carnegie Mellon, our faculty and students started 173 new companies between 2011 and 2016, a subset of which has raised more than $1 billion in investments since 2011. About 74% of those funds remained in Pennsylvania, contributing to the regional economy. Other academic institutions across the US see similar results. In today’s competitive environment, universities must also develop new partnerships with leading companies, foundations, and other research-intensive institutions. These partnerships are not just about transferring knowledge from lab to practice. They provide critical funding for talented faculty and students to pursue foundational research, enable students and faculty to exchange ideas with the very best minds inside and outside the academy, and perhaps most importantly, help to prepare students to be citizens of a rapidly changing world. Corporations are recognising the high-value, high-return offered by these collaborations. 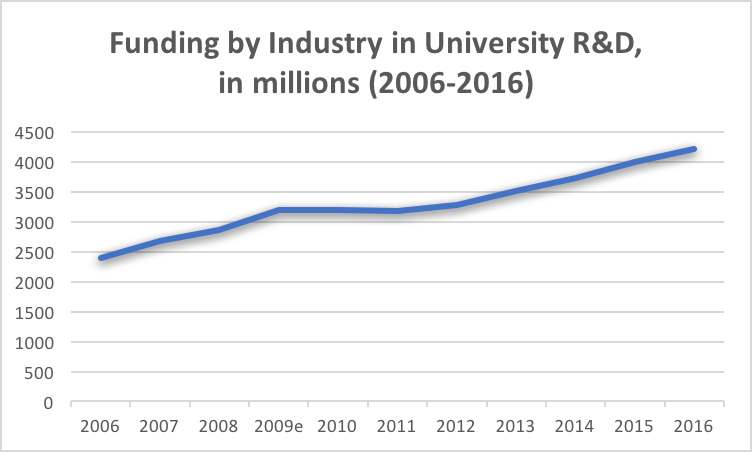 According to data compiled by the National Science Foundation for the US, industry funding for university research and development has grown by more than 5.5% per year on average over the past 10 years, from about $2.4 billion in 2006 to more than $4.2 billion in 2016. Even after adjusting for inflation, this funding has grown at roughly 4% per year, from about $2.5 billion in 2006 to about $3.8 billion in 2016 (denominated in 2009 dollars). This trend is not limited to the US. The European Commission has also doubled down on university-industry partnerships with the creation of the European Institute of Innovation and Technology (EIT). Through their Knowledge and Innovation Communities, the EIT fosters co-operation between academia, research and business at more than 30 co-location centres in 15 member states. Successful university spin-offs and corporate partnerships don’t tell the full story. As this economic transformation quickens, it is critical that universities continue to focus on incorporating diverse perspectives into our work. In the US, expanding the opportunity for diverse voices, especially in STEM-related jobs is not just the right move – it is necessary to meet the economic demand posed by our tech-driven economy. 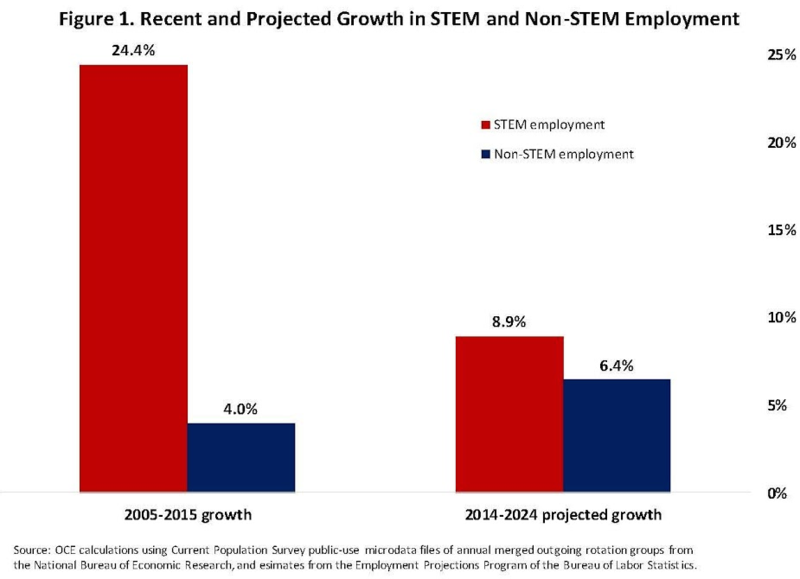 The US Bureau of Labor Statistics projects STEM occupations to grow by about 8.9% from 2014 to 2024, compared to 6.4% growth for non-STEM occupations. Most of those jobs will be in computing-related disciplines – about 55%. Data also tells us that more than two-thirds of those jobs could go unfilled due to the insufficient pool of college graduates with computing-related degrees. By not expanding the pool of job-seekers, we risk falling short of the growing demand, with serious consequences for the future of technical innovation. To address this critical issue, The University of Maryland Baltimore County (UMBC), for example, launched the Meyerhoff Scholars Program in 1989 to expand the pipeline of individuals from racially, socio-economically and geographically diverse communities who are pursuing graduate work in STEM fields. These efforts are paying off. Today, UMBC is among the top 10 baccalaureate institutions for graduating African American students who go on to earn PhDs in the natural sciences and engineering. Other universities are following suit, and have committed to increasing the diversity of women and under-represented minorities in their programmes across the board. Universities can play a key role in ensuring these economic gains are shared across the economy, and not just among those that pursue advanced degrees in advanced technologies. In Philadelphia, Pennsylvania, for example, Drexel University and the University of Pennsylvania have partnered with the public, private and civic sectors to create the West Philadelphia Skills Initiative, which offers training, support and ladders of opportunity for jobs at the sub-bachelor level for residents of the West Philadelphia neighborhood. Since 2010, the initiative has placed more than 120 individuals, many of whom are members of historically disadvantaged communities, into meaningful jobs in some of the world’s leading institutions. There is no guarantee, of course, that technology will automatically benefit humanity. Here, perhaps, lies the greatest obligation for institutions of higher education in the digital revolution. It is up to us to provide the ethicists, artists, and philosophers who can point the way; the policy experts and economists who can draw the map; and the cognitive scientists and sociologists who help ensure the destination is designed for people as well as machines. And it is up to us to make sure these scholars are working side-by-side with the applied researchers and technologists who are driving the revolution. US labour markets have evidenced an impressive ability to absorb staggering changes in technology – but not without a troubling increase in inequality among our citizens. The graph below breaks down wage trends over time by education level, with a growing gap in earnings between the best educated and the least educated over time. While the American Dream still works for some, our less educated citizens have seen their real incomes fall since the early 1970s. The best labour economists predict that the next wave of disruptive innovation will continue to exacerbate this inequality. What is the future of work in this new era? As educators, we have a singular responsibility to prepare all students for a rapidly changing job market, and to educate them to be architects of the world in which we live. In today’s economy, when the future of work is changing faster than our old models of education can accommodate, this is no easy task. History tells us that those who prepare for the seismic shifts in work activities will have an immense opportunity to flourish. As stewards of the future of education, with access to immense intellectual resources and the influence to apply those resources to our core mission, university leaders have a leading role to play in helping the workforce adapt to these disruptive technologies, ensuring that the new economy works for everyone. As the world’s leaders in industry, government, and education engage on the future of work and other important topics at this year’s World Economic Forum in Davos, universities must play a committed role to addressing these challenges and seizing these opportunities. To succeed, we all must ensure that talent from the diverse, global community has access to opportunity in the new economy.